A $250 million master plan for redevelopment of the former Portland Co. complex envisions a gleaming six-block neighborhood with upscale housing, shops, restaurants, hotel rooms and a 220-slip marina. 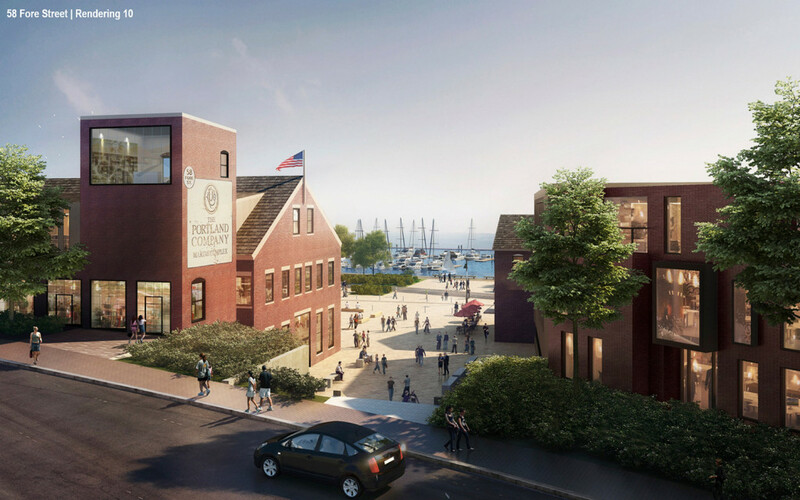 A former railroad foundry on Portland’s eastern waterfront would be transformed into a shiny high-end neighborhood with six blocks of housing, shops, restaurants, hotel rooms and marina slips under an ambitious and long-awaited redevelopment plan submitted by local developers. 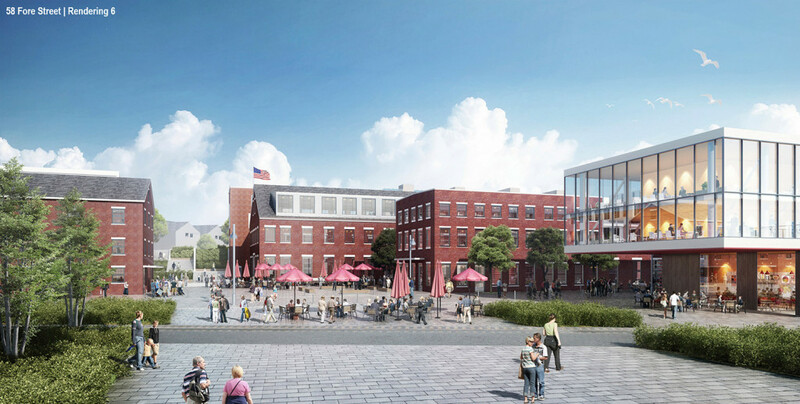 The scale of the development, which features a mix of glass-walled buildings and historic brick structures and is estimated to cost about $250 million, makes it one of the most ambitious projects ever proposed in Maine’s largest city. CPB2 submitted its master development plan for the 10-acre parcel at 58 Fore St. to the city on Monday, and plans to formally unveil it at a news conference Wednesday morning. It will be the first time that detailed renderings have been made public, although the project has been hotly debated for more than two years. The former industrial land at the entrance to Portland’s inner harbor has been the subject of speculation about its future on and off for decades. City Manager Jon Jennings described the proposal as “very exciting” and ambitious, while noting that the city would review it carefully. But he celebrated the proposed density as fitting for the Portland peninsula. The master plan calls for nearly 960,000 square feet of development and 435,200 square feet of parking. The combined size of the buildings is nearly as large as the Maine Mall in South Portland, which has about 1 million square feet of retail space. The project’s scale tops the 30-acre Thompson’s Point development in Portland, which is approved for 641,000 square feet of building area, not including parking. “It’s certainly in the top tier … of proposals in terms of size,” said Planning and Urban Development Director Jeff Levine. The price of roughly $250 million is more than double the estimated $110 million cost of the Thompson’s Point project. And it’s about half of the estimated $512 million cost of the expansion proposed last week by Maine Medical Center on Portland’s West End. 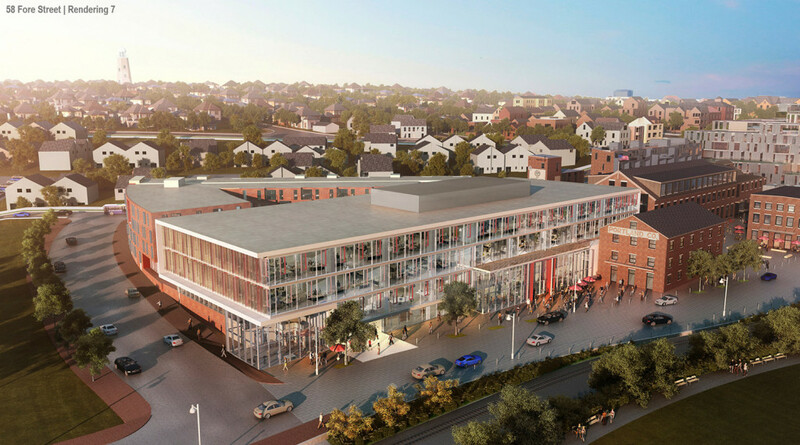 The Portland Co. proposal calls for 638 units of rental and ownership housing, 132 hotel rooms, nearly 60,000 square feet of retail space and nearly 124,000 square feet of office space. The project would trigger the new inclusionary zoning ordinance passed last year, requiring 10 percent of the housing units in developments of 10 units or more to remain affordable to middle-income earners. The developer, however, can opt out of that requirement by paying the city’s Housing Trust Fund $100,000 per unit of mandated affordable housing not offered. “It’s unclear whether we would build them or buy them out,” Brady said, adding that he expects to have a diverse range of housing because the market won’t support luxury units alone. CPB2, which includes Brady, Casey Prentice and Kevin Costello, bought the former Portland Co. complex in late 2013 for $14.1 million. Since then, they have been working on a development plan that conforms to the Eastern Waterfront Master Plan that the city adopted in 2004. The project ran into stiff opposition last year from neighbors on Munjoy Hill who worried about losing their ocean views. After the City Council rezoned the land to allow taller buildings and more uses, residents in the area forced a citywide vote to protect the view along upper Fore Street. That ballot measure failed by a large margin. The master development application launches the formal review process for the Planning Board, which will be asked to approve the general development plan and uses proposed for the site. Once approved, developers would have to return to the board to get individual site plan approvals for each new building. The master plan approval lasts 10 years, including extensions. The master development plan “allows the city and developer to talk about big-picture issues,” Levine said. According to the plan, the tallest buildings approach 65 feet and would be east of Waterville Street. Parking spaces would be below the buildings. Because heights are measured at the average grade of the steeply sloped land, some buildings in that area would be eight stories high. The westernmost building also would have structured parking beneath it and have a maximum height of 35 feet, while the building just west of Waterville Street could be as high as 45 feet. A total of 736 parking spaces are proposed for the site, mostly on the ground floors of the buildings. Founded in 1846, the Portland Co. complex was built to connect Portland to Montreal by rail and was the first locomotive factory in the United States that brought all of the necessary shops and foundry together on one site. It remained in operation for 137 years and was deemed eligible for the National Register of Historic Places in 1976. Contemporary buildings would be built around seven historic buildings that will be preserved and restored. One of those buildings, the Pattern House, is expected to be moved 230 feet closer to the waterfront as part of the redevelopment. Two- and three-story townhouses are proposed along Fore Street. Their facades would include brick, textured metal, wood and glass. Those buildings would taper down the existing slope into “glassier, transparent buildings along the water’s edge,” according to the plan. The plan calls for more than 223,000 square feet of public open space on the ground level, including plazas between buildings, waterfront access through a 50-foot-wide easement and view corridors at Kellogg, Waterville, St. Lawrence and Atlantic streets. There is an additional 72,000 square feet of vegetative rooftop terraces for private use. A key piece of the development is the proposed marina, occupying about 13 acres of submerged land. It would consist of 220 boat slips, 80 of which would be designated for visiting vessels. The marina, which would have 100 parking spaces and is estimated to cost $20 million, also calls for a special kind of dock system that functions like a breakwater to protect vessels along the piers. Thames Street would be extended along the water’s edge to create a new retail district incorporating the seven historic buildings that would be preserved, as well as the base of a new office building, hotel and waterfront pavilion. 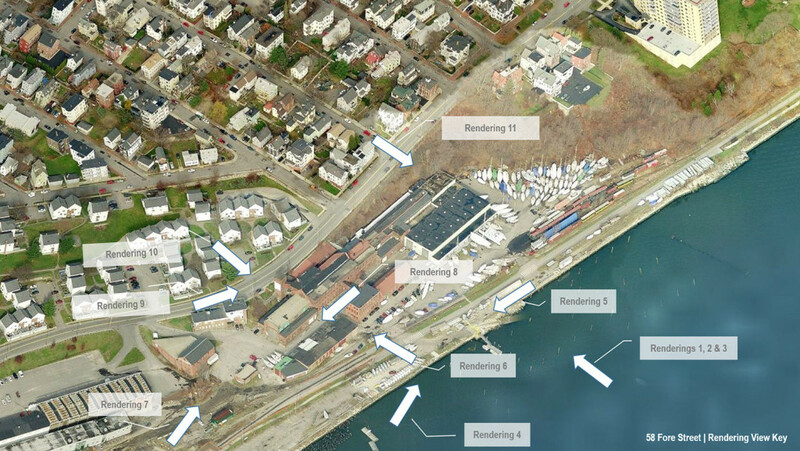 Renderings show a waterfront walking trail and rail lines. A March 2015 economic analysis commissioned by the developer estimated that the project would add $85 million to the city’s tax base, generating an additional $1.7 million in annual tax revenue. It also estimated that direct and indirect construction-related spending would top $215 million, including 1,400 new jobs with wages totaling nearly $68 million. However, that analysis was based on a comparable area in the existing Old Port, rather than a specific redevelopment plan. The master development plan does not commit the developer to build what is proposed. Instead, it sets limits on the maximum square footage that can be allocated for each specific use and can be subject to change depending on the market and other factors. Developers at Thompson’s Point unveiled ambitious plans in 2011 for 30 acres in Libbytown. That master development plan has been amended several times and the buildout has been slow. Rather than immediately moving forward with tall buildings and an arena, the developers are renovating historic buildings and filling them with creative enterprises, such as breweries, restaurants and art studios. Thompson’s Point received a tax break valued at $32 million over a 30-year period to help offset the estimated $110 million in development costs. Brady said he does not anticipate seeking a similar deal, known as tax increment financing, to offset private development costs. He said the road through the site will be privately built and maintained and open to the public. Jennings noted that the city will need to make some investments in public roads, including a new road that could lead into the site from Thames Street. “We certainly have to figure out how we’re going to pay for certain infrastructure investments,” Jennings said. Levine said the Planning Board could begin conducting workshops as early as October. 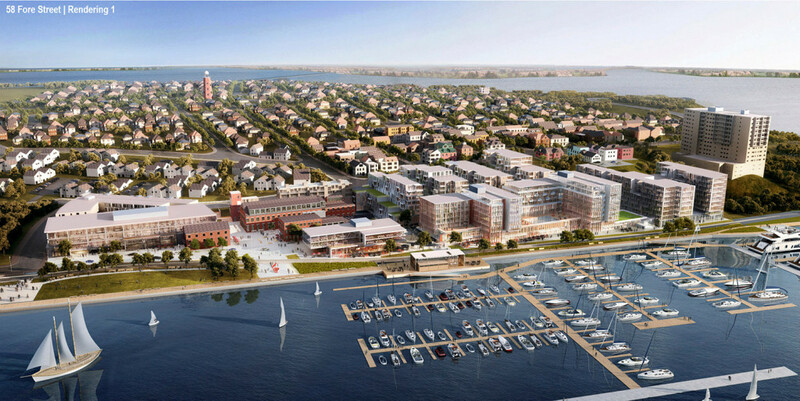 If all goes well, Brady said construction on the first phase of the project, which would likely include the marina and other development blocks, could get underway by next summer.